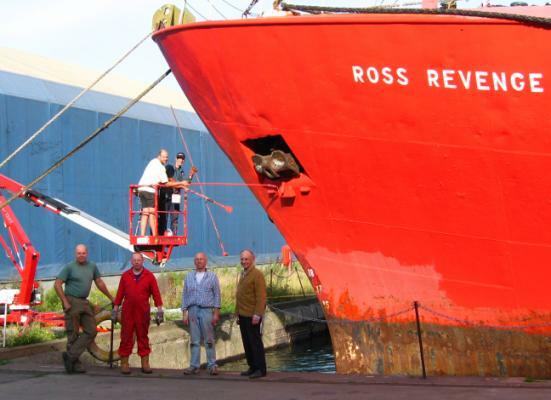 As of May 2005 the Ross Revenge is moored inside Tilbury Docks at Berth 12 - between the cement terminal and the scrap metal berth, Not the most glamourous of locations for the lady. As this is a working dock, and is a secure area, there is absolutely no public access whatsoever. 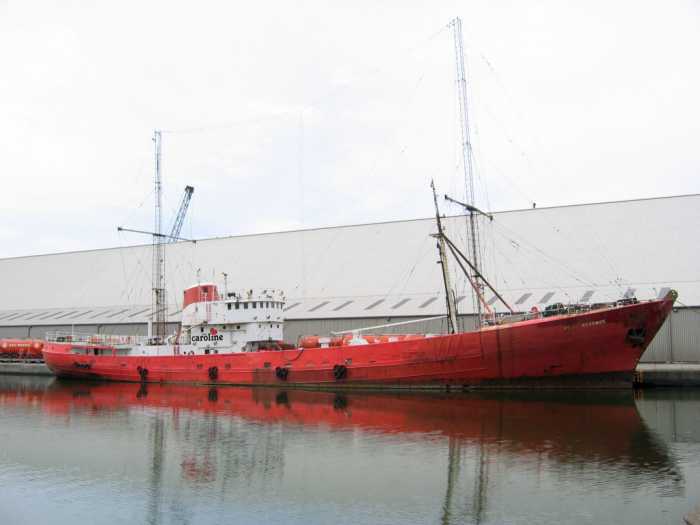 However, with the old girl moored in a non tidal basin, alongside a concrete quay, she was just crying out for a good old lick or two of paint. 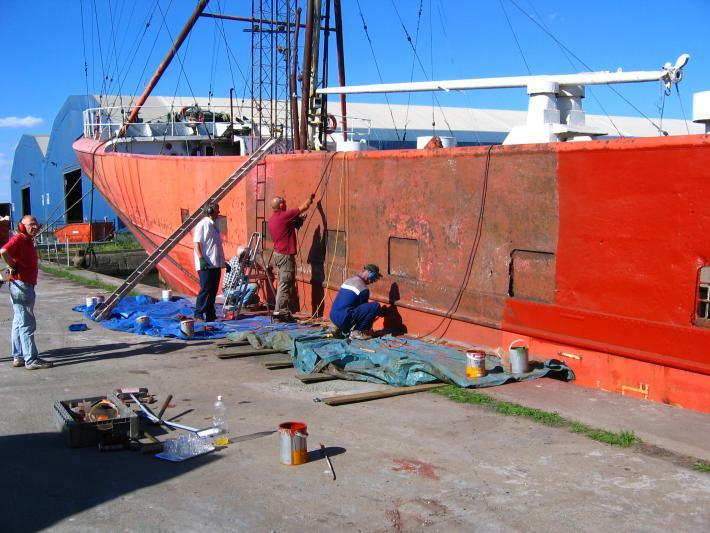 It has been many years since the hull has been painted, particularly the portside. 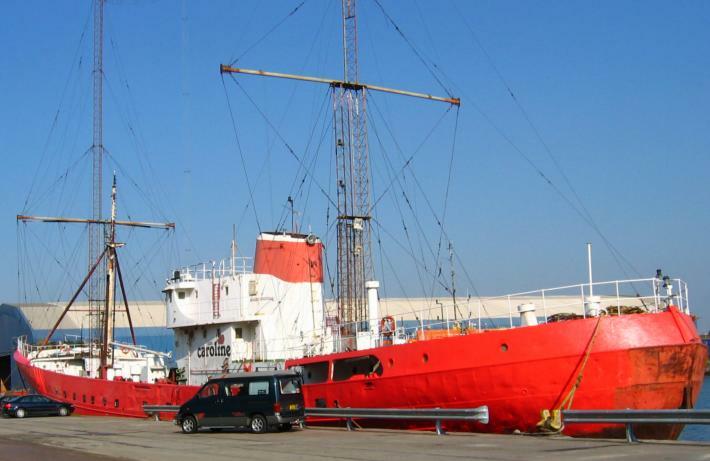 In fact, it may be as long ago as 1982 since the paintwork was taken down to bare metal, re-primed and repainted. 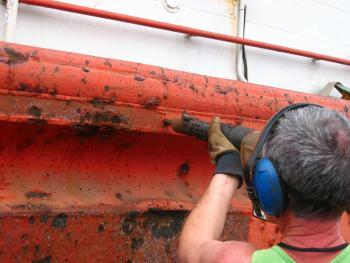 Most of the paint which has been applied since then has simply been slapped over the old paint, rust and all. The quayside was the ideal opportunity to really go to town, but first we had to negotiate with Tilbury docks. 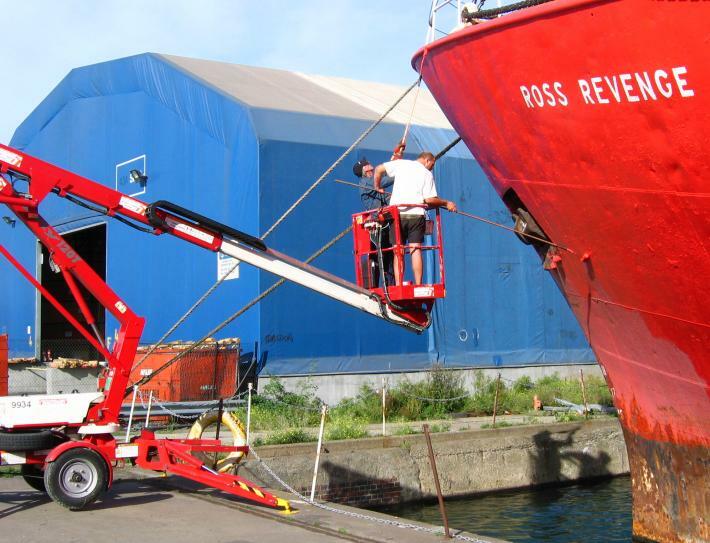 As the docks is a working port, where ships come in and load and unload their cargo, the port are not used to repair work and maintenance being carried out. 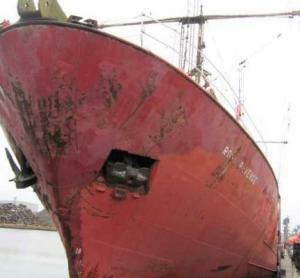 We had to give assurances that we would be responsible, not drop rust, debris and paint into the water, not spill paint over the quayside, etc. 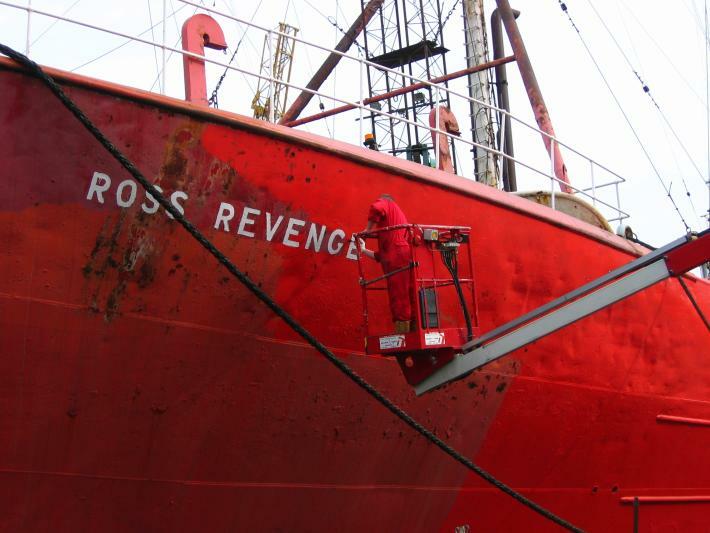 Whilst those negotiaions were ongoing, we set to work with repainting the back deck. Again, it has been many years since this has been taken down to clean metal, and many weekends in June and July were spent hammering the rust bubbles, needle-gunning, and grinding to get rid of the rust and old paint. Finally, Tilbury Ports gave us the go ahead to start on the hull, and a happy band of volunteers all arrived over the bank holiday weekend at the end of August - for some this was to be their summer holiday. A week of ship painting! 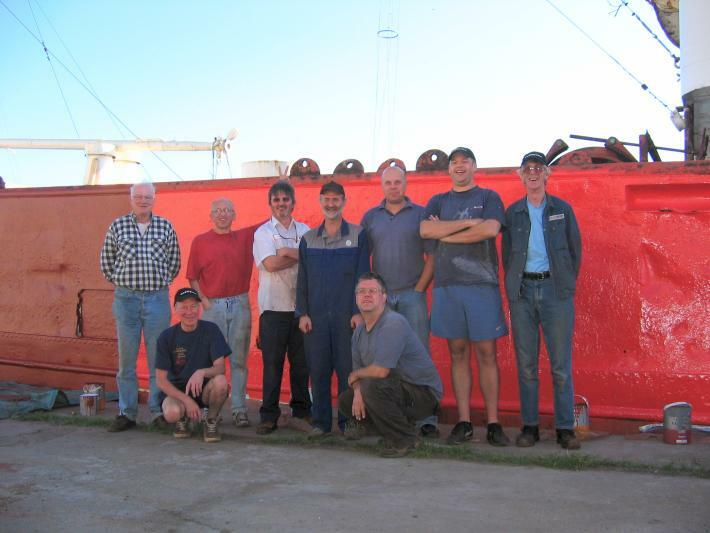 Here we see four members of the team, Tommy, Lee, Graham and Rod, at the start of the week, working on the portside hull. This picture shows quite vividly the faded paint, and the numerous rust bubbles that have grown over the years. 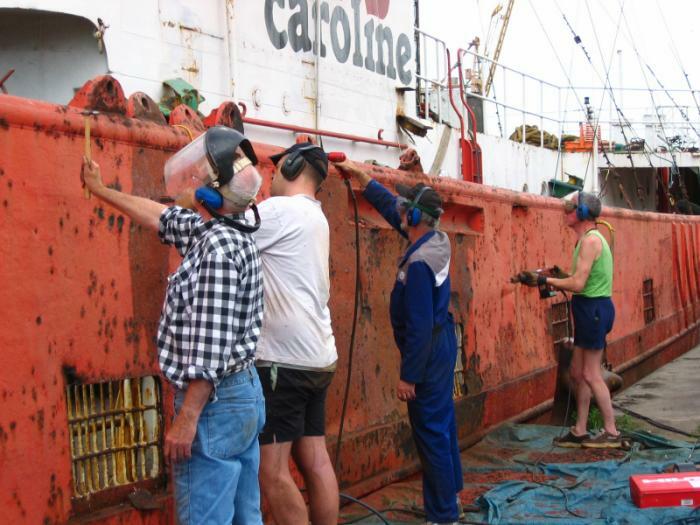 Note everyone is wearing ear protectors, face mask or goggles - hammering and operating air tools against the hull makes a lot of racket, and rust and paint fragments are flying everywhere. You could hear the noise over much of the docks on the Sunday when there was little other activity. Not to mention the fact we had a pair of very large loudspeakers rigged up on the deck to keep us entertained above the racket. In both Queenborough and Rochester it was the starboard side which faced the land, and this was the side which was always given priority. Again, at both Southend pier in 1999, and Tilbury in 2004, it was the starboard side which was most visible to the public, and again, this side was touched up before the two RSL's. 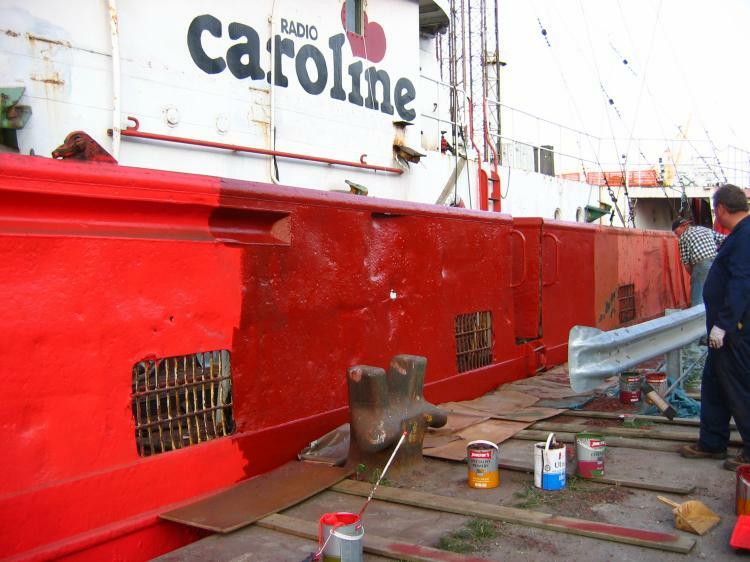 Thus, the portside was very much neglected, and well over due for a re-paint. 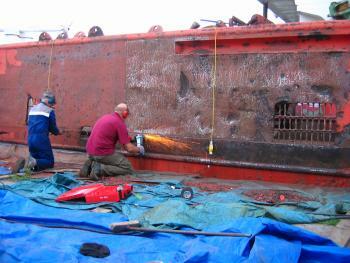 Left: Graham, and first time volunteer Phil destroying rust bubbles with the needle guns; Centre: A close up of the air chisel - note the amount of loose paint and debris already removed; Right: Tommy doesn't stop needle gunning even when having an orange juice - perhaps the rust flakes add to the flavour. We developed quite a technique for working on the hull. Firstly the large rust buubles are hit very hard with a hammer - this removes the loose flakes, and also burst the bubble showering dust all over the floor. 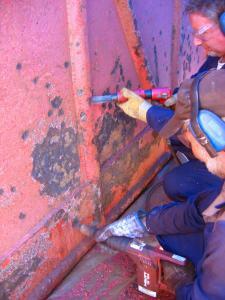 Then, the air chisel is used to get into the back of the bubble, and remove all the debris and muck. Needle guns are used to clean the remains of the bubble away, plus remove the rest of the old paintwork which has not rusted, and finally the whole surface is cleaned to bare shiny metal using the angle grinder. Two coats of top quality red-oxide primer are left to adhere fully to the clean metal, before finally the top coat is applied. Once dry, usually the next day, a second layer of top coat gloss is added. 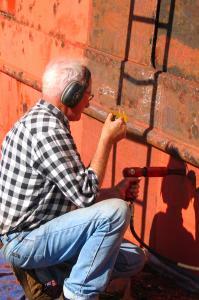 Using this technique, we managed about 8 metres of the hull a day, with usually 4 or 5 people at work at any one time. 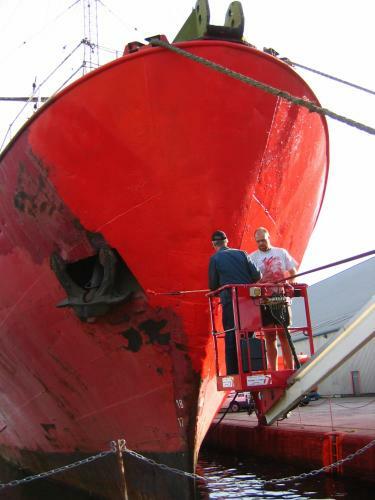 In addition to the ships own tools, A-Plant Hire, courtesy of Andrew Austin loaned us extra angle grinders and an electric Hilti needle gun, which really was the Mutts Nuts at removing the old paint. Underneath all the rust and flaking paint we found evidence of green paint in a few nooks and crannies, suggesting that once upon a time the old girl was a nice dark green. Day 2, or was it Day 3? John, Tommy, Steve and Graham hard at work whilst Howard supervises. You can see the previous days red oxide coating to the right. 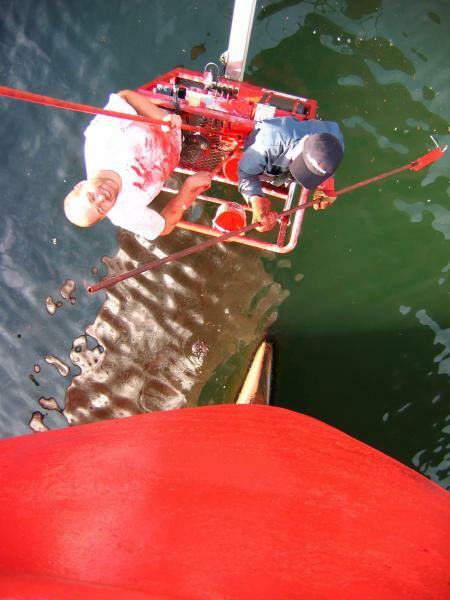 Once the current section has been prepared and red-oxide is being applied, the previous section will get its first top coat. 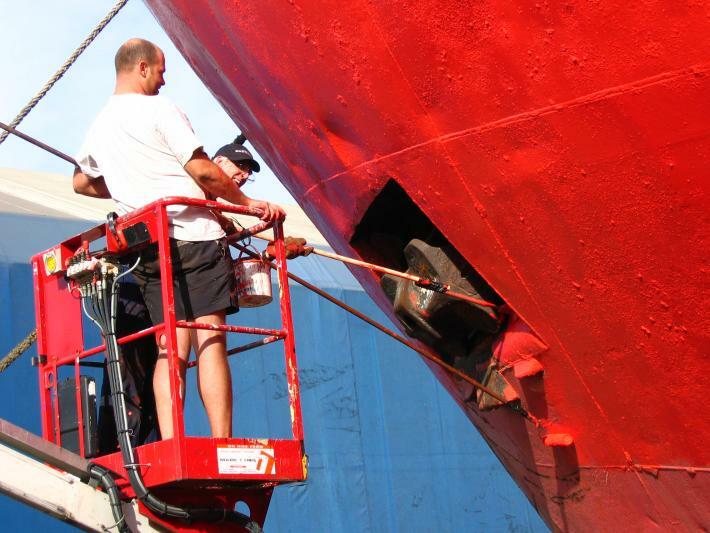 Working in this manner ensures that the new paint does not collect any flying dust. Note also the tarpaulins and work surfaces on the floor. We placed 8 by 4 sheets of hardboard, supplemented with various bits of old plywood on the quayside and butted them up to the side of the hull. Tarpaulins were wrapped around these boards, and short polythene sheets taped to the hull were draped over the tarpaulins. 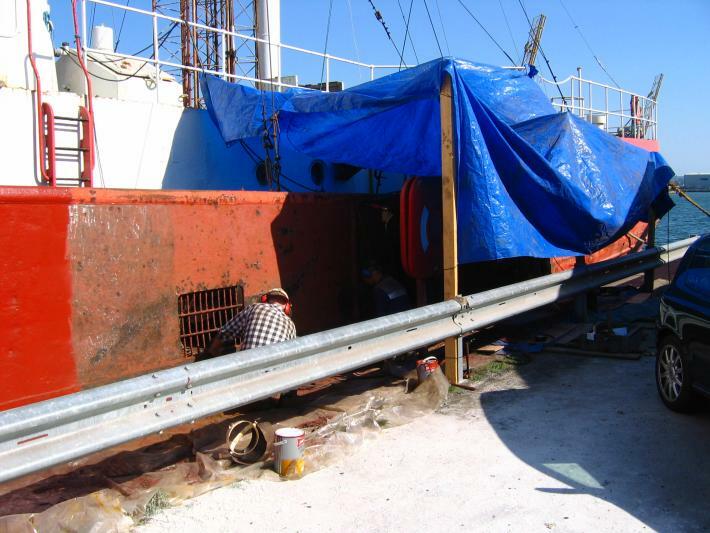 This ensured the debris all lands on the tarps from where we can brush it up, and not into the dock. Along most of the edge, there was a gap of 4-10 inches between the quay and the ship, the wooden boards prevented anyone from putting their foot in it, so to speak. 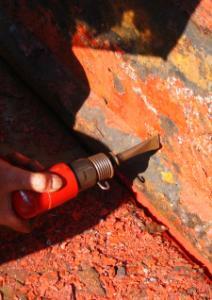 Rod, busy destroying rust bubbles and removing old paint with the Hilti needle gun. 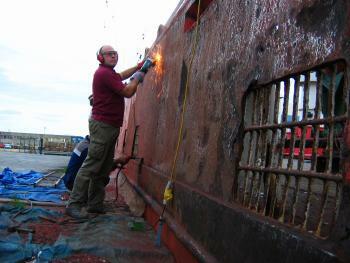 Steve Dack attacking the old girl with an angle grinder to produce clean metal. 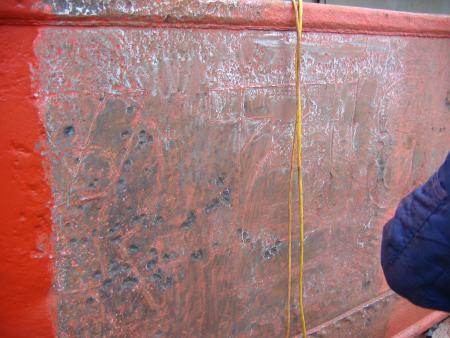 This part towards the stern clearly shows the marks where the name, and previous registration "GY 718" have been cut into the hull. Once the primer has set, the top coat can be applied. Here, John, Tommy and Howard are applying the very first top coat and we were somewhat startled to find the red was more of a pinkish colour. 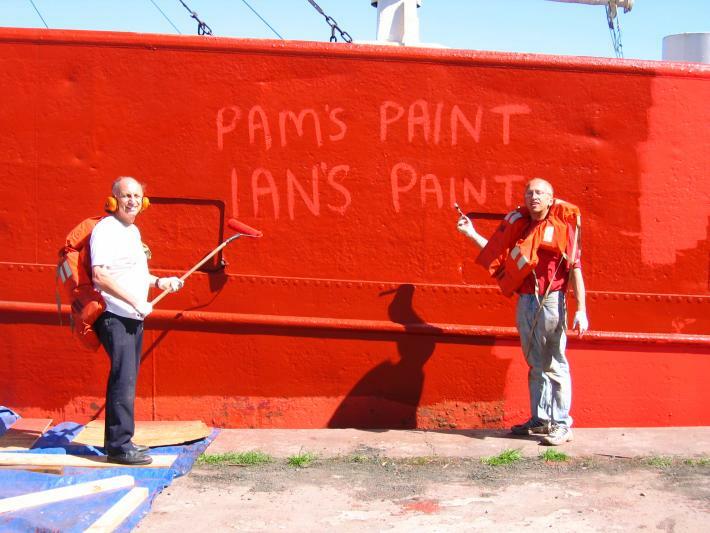 However, once two coats were applied and it had a chance to dry, it came up as a very bright solid red and we were all happy with the results. With one section now with two coats of top gloss, and the next section primed in red-oxide, the chipping, hammering and grinding gang can move along to another length. 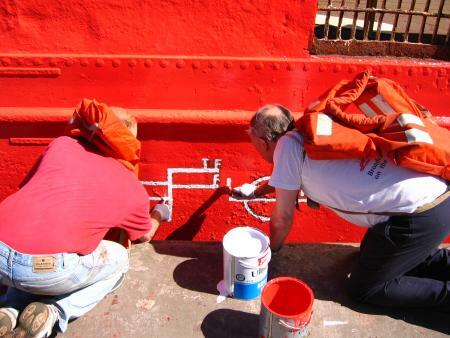 Meanwhile, Howard and Roland start to repaint the ships Plimsoll line. Howard, left and Roland, right. What a difference. Fresh new red paint to the left, red oxide in the middle and shabby old paintwork to the far right. The week started out cloudly and overcast, but for once the forecast was right and as the week wore on it got hotter and hotter. By Wednesday and Thursday it was well over 30 degrees and a cloudless sky. Working in such conditions was very uncomfortable, so we had to rig up a makeshift sunscreen using an extra tarpaulin and some planks of wood attached to the safety fence. This did the job quite nicely, and with the breeze blowing, it was at least possible to continue to work whilst the sun blazed down. All of the crew are amazed how clear the water is within Tilbury docks compared to the mudd that continually swirls around the Thames. 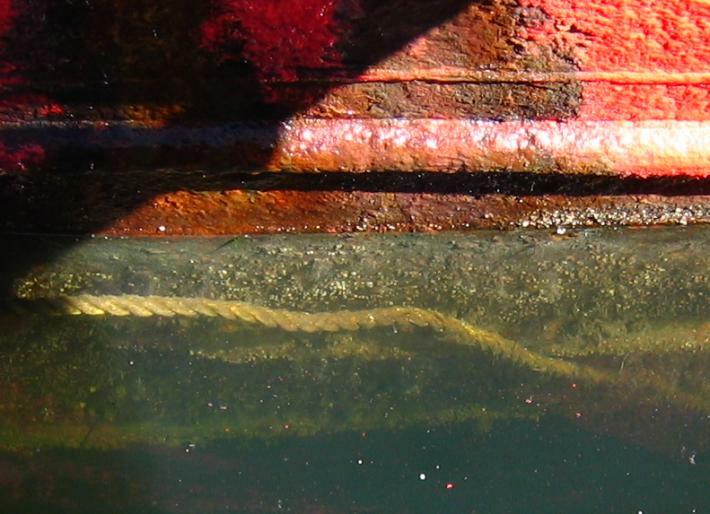 Here we can see at leat 4-6 feet down into the water, showing crustations growing on the hull of the ship, along with two of her stability ribs under water. A bit of old rope in the water also gives depth to the visibility. The docks are also teaming with thousands of small fish and jelly fish, as well as some very mature Sea Bass, often in excess of 15 inches long. Add to this a number of familes of swans, there is a lot going on in the water than first meets the eye. The crew, at an early stage in the week. L-R:Tommy, Rod, Howard, John, Graham, Alan, Steve, Lee, David. By the end of the August bank holiday week, we had painted most of the port side, with the exception of about the last ten feet towards the stern, the rounded part of the stern, and much of the bows as it was out of reach. After a well earned rest getting on with our normal lives throughout September, we staged Phase 2 of the paint-athlon over the weekend of 8 and 9th of October. This time, we hired some extra help to get us into the right places. Lee and David reaching the parts other paints cannot reach... With a litle help from a Nifty Lift 120. We had the lift on hire for two days, and were determined to get all of the bows painted. 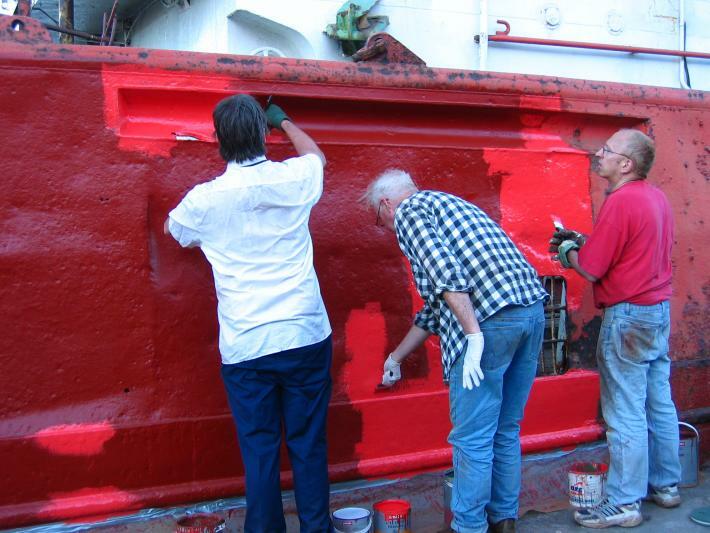 If you have ever closely inspected the bows you will have noticed many different shades of red paint, none of which lined up due to the number of different methods used over the years to paint this inaccessable part of the ship. However, accessability was no longer an issue! Getting into those awkward parts around the anchor. I wonder when this area was last painted? A short while later. Note the fresh bright red paint. 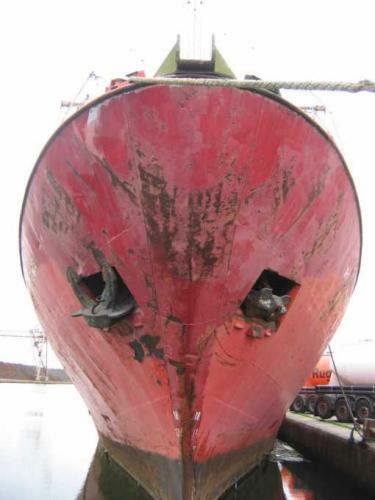 It would have been totally impractical to hammer and chip the metalwork over the bows to bare metal and re-prime like we had done on the rest of the hull. Therefore we had to be content to just apply two coats of new paint ontop of the old paint, after removing the largest and flakiest pieces of rust by hand. A dramatic view looking down on David and Lee painting the bows. Picture was taken by leaning, rather nervously, over the chain guide on the top of the forepeak. Note just how sharp her ice-breaking bow is where it enters the water. 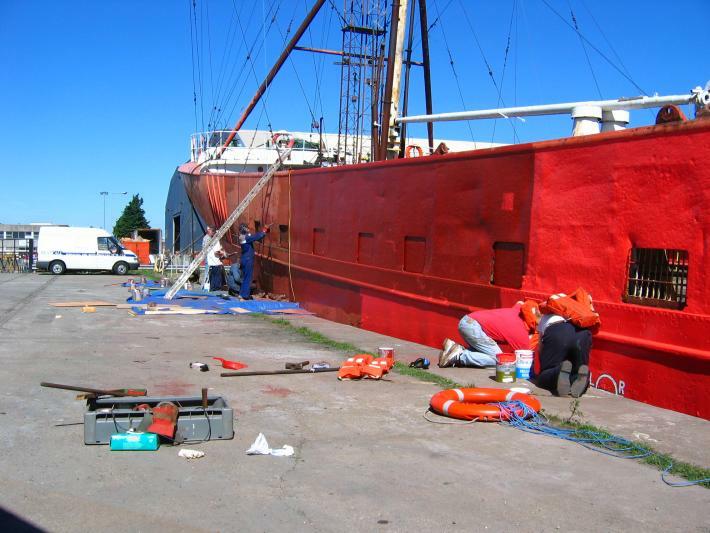 Even with the aid of the Nifty Lift havng paint rollers attached to the three metre poles was essential to get to as much of the bow area as possible. Before and during. Can you spot any difference? Before and after with some of the weekends crew. The one problem we found with the nifty lift, was that it would not go out horizontally staright, hence the little patch above the water line which remains unpainted. No matter how we manipulated it, or used the three metre rollers we could not get to that bit. So perhaps the ships dinghy will save the day once more. Whilst the Nifty Lift was in use at the pointy end, other crew members were busy at the rounded end. The remainder of the hull was taken down to clean metal and primed and painted, and using the three metre rollers, we even managed to get most of the way round the back. But not quite all the way! 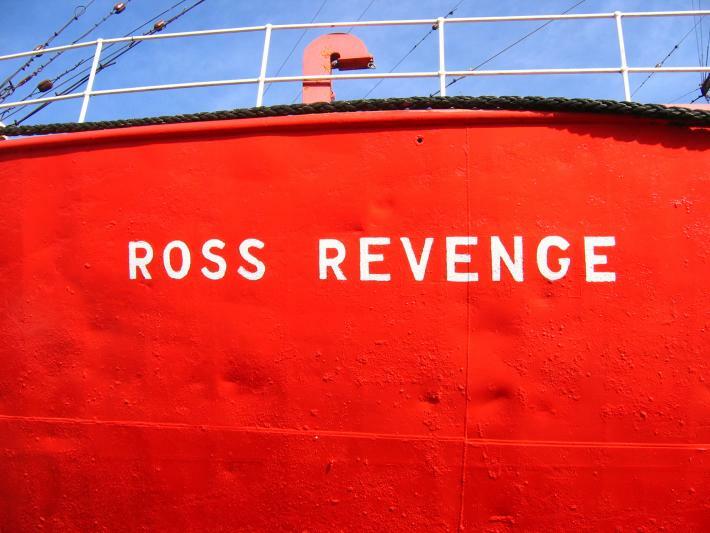 So here she is in her splendid new paintwork - and just a little bit at the rear to remind what she used to be like. Considering it is almost mid-October we had a glorious weekend - temperatures exceeded 20 degrees which was just perfect for working outside and painting. A big thanks to evberybody who worked in both the August and the October teams. And a special thank you to Kalon Paints and Johnstones-Leyland for their support. Please support those who support Caroline. 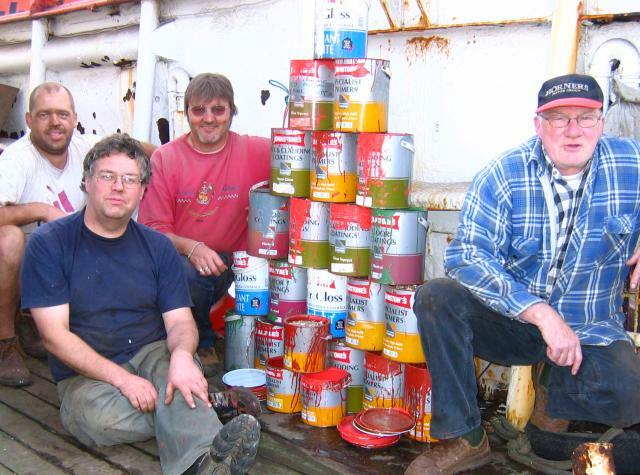 Lee, Alan, John and Tommy with about half of the remnants of the Summer 2005 Paint-athlon.